The medical image analytics is the science of solving and analyzing medical problems based on different imaging modalities such mammography, MRI, computed tomography (CT) and ultrasound, radiography X-Ray and combined modality, among others. Further, the primary purpose of medical image analysis is the extraction of meaningful information to support disease diagnosis and therapy. The software plays a vital role in medical image analytics. It is a program designed to perform specific task. It helps in analytics and interpretation of large volume of medical data and images. A very vital function that medical software performs after the image has been acquired in digital form is the analysis of the acquired image to extract medically or clinically relevant information for diagnosis and treatment planning. Software capable of performing these functions are known as medical image analytics software. These software can be a general purpose or designed for a specific medical application. The general purpose software can perform regular image processing application like segmentation, contouring and thresholding to make the region of interest more prominent and obvious as compared to the surrounding regions. However, the medical image analytics software for specific applications are designed to perform detailed analysis of specific organs or organ systems as per the requirements of medical diagnosis. Such applications have been developed for cardiovascular system including the heart, for central and peripheral nervous system including the brain, for orthopedic and musculoskeletal systems, for nephrology, oncology and many other medical fields. This research study includes an extensive analysis of the global medical image analytics market, by product, imaging modalities, application, end-user and geographical regions, allowing the researcher to develop a comprehensive outlook of the market. Each of these segments have been analyzed on the basis of their current and future market size, considering the macro and micro environmental factors. The market report presents a detailed and investigative study of the entire market and provides a comprehensive insight into various forms of developments, trends and the key market participants. While highlighting the key driving and restraining forces for this dynamic market, the report also provides a comprehensive section on competitive landscape, market share analysis, competitive benchmarking, and the position of the competitors within the global medical image analytics market. • What are the major market drivers, challenges and opportunities of the global medical image analytics market? • How the medical image analytics evolve and what is its scope in the future? • What were the market shares of the leading segments and sub-segments of the global medical image analytics market in 2016 and what will be the shares in 2025? • How will each segment of the global medical image analytics market grow during the forecast period and what will be the revenue generated by each of the segments by the end of 2025? • How the market share of the leading companies changed in 2016 and which country will lead the market in 2017? • How the market has been segmented on the basis of product, imaging modality, application, end-user and region? • Which product, imaging modality, application and end-user will dominate the global medical image analytics market by the end of the forecast period and which one will be growing at the highest CAGR during the forecast period 2017-2025? • What will be the growth rate of different segments during the forecast period? Which is the leading segment by product, imaging modality, application, end-user and region? • Who are the key players for the medical image analytics market? • Which geographical region will lead the global medical image analytics market by the end of the forecast period? • Which country is expected to grow at the highest CAGR during the forecast period? 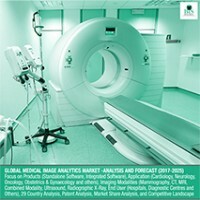 The key players which have significant contributions to the medical image analytics market are Siemens Healthineers, GE Healthcare, Hologic Inc., Toshiba Medical Corporation, Agfa Healthcare, Infinitt Healthcare, Media Cybernetics, MIM Software Inc., Philips Healthcare, Carestream Health, Aquilab, Hologic Inc., Neusoft Medical, Mirada Medical Ltd. and Dentsply Sirona, among others. 12.19 Circle Cardiovascular Imaging Inc.
39 Overview: Merge Healthcare Inc.
41 Overview: Mirada Medical Ltd.
42 Overview: MIM Software Inc.
51 Overview: Circle Cardiovascular Imaging Inc.
Advances in healthcare IT technologies, computing power, faster networks and cheaper storage has revolutionized medical imaging over the recent past, allowing doctors to manage images, analyse, and interpret more easily and flexibly than in the last decade. Computerized medical imaging analysis is one such advancement that have been the central focus in medical imaging in last few years. Medical image analysis has become a vital technology in high-tech applications in diagnostics and ubiquitous part of modern medical imaging systems and the related processes of clinical diagnosis and intervention. Recent advances in machine learning, especially with regard to deep learning, are helping to identify, classify, and quantify patterns in medical images. Medical image analysis software application perform a vital role after the image has been acquired in digital form is the analysis of the acquired image to extract medically or clinically relevant information for diagnosis & treatment planning. It can be either for a general purpose or designed for any specific medical application area. The general purpose software can perform regular image processing applications such as segmentation, contouring and thresholding to make the region of interest more prominent and obvious as compared to the surrounding regions. Medical image analysis has great impacts on both clinical applications and scientific researches. Recent progresses in deep learning have shed new light on medical image analysis by allowing discovering morphological and/or textural patterns in images solely from data. As machine learning methods have achieved the state-of-the-art performance over different medical applications, its use for further improvement can be the major step in the medical image analysis field. However, there are still unanswered challenges to universal implementation of image analysis solution, with the need to establish quality standards, reduction of errors, and interpretability. The product segment of the market comprises standalone software and integrated software. The standalone software acquired the highest market value in 2016 and growing at the CAGR of 5.2% during the forecast period 2017-2025. This can be attributed to the advantages associated with standalone software such as high flexibility with user friendly interface to visualize, observe, evaluate and process medical image data from different modalities. However, integrated software is growing at the highest CAGR 7.9%. The imaging modalities segment of the market comprises of mammography, computed tomography (CT), magnetic resonance imaging (MRI), combined modality, ultrasound and radiographic X-ray, among others. The ultrasound segment constituted the highest market value in 2016 and growing at the CAGR of 5.6% during the forecast period 2017-2025. The growth can be attributed to the high adoption rate of ultrasound due to the significant advantages it provides such as precision in identifying the nature of lesion, low cost and lack of exposure to radiation. However, magnetic resonance imaging (MRI) is growing at the highest CAGR of 7.9% due to the forecast period 2017-2025. The application segment comprises of cardiology, oncology, neurology, orthopedics and obstetrics & gynecology, among others. The obstetrics & gynecology segment account for the highest market value in 2016 and growing at the CAGR of 4.6% during the forecast period 2017-2025. However, the dental application segment is growing at the highest CAGR of 7.9% during the forecast period 2017-2025. The end user segment comprises of hospitals and diagnostic centers, among others. The hospitals segment constituted the highest market value in 2016. The most important buyer of medical image analytics software are the hospitals which are significantly increasing in number. However, the diagnostics centers segment is growing at the highest CAGR of 8.8% during the forecast period 2017-2025. North America generated the highest market value in 2016. This can be attributed to the rising incidence of various types of chronic diseases, technological advancement in imaging equipment, increasing disposable income and support of government in enhancing the healthcare facilities and providing reimbursement policies for the end-users. However, RoW, comprising of Kingdom of Saudi Arabia (KSA), Israel, South Africa, Qatar, and UAE, among others, is expected to grow at the highest CAGR of 8.5% during the forecast period 2017-2025 followed by Latin America, owing to the rising incidence rate of chronic diseases, increasing disposable income.